Summer is almost over, and temperatures are starting to drop across the country. For outdoor pool owners, this means it's time to start thinking about covering the pool and preparing it for the cold winter ahead. If you don't prepare properly, you may need to perform some serious maintenance when warming temperatures arrive in spring. The inclement weather may even damage your pool structurally, making it necessary to carry out expensive repairs. In this post, we give you a rundown of our top winter pool care tips. If you've had your pool for a few years, it's likely that you're using the same pool cover, too. Wintry weather can have a punishing effect, even on plastic, and as the seasons pass a pool cover can degrade and crack. This will allow leaves, debris and rainwater to enter the pool, defeating the point of having a cover in the first place. Ice and freezing weather can harm a pool's internal systems, and once this damage has occurred it will be a headache to sort out, especially since you'll probably only discover it once you remove the cover again. And it will steal your swimming time too! When replacing your cover, remember: not all covers are created equal. You'll need to shop around to find the best one for your pool. 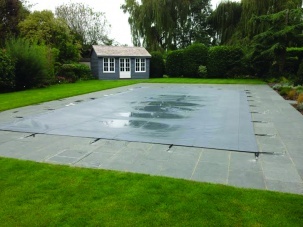 If your pool is an unconventional shape or a bespoke design, you may need to have your cover specifically made to measure. Every pool owner wants the same thing, and that's to remove the covers in spring and find a pool that's ready to use (or close to it). With this in mind, it might be an idea to upgrade or refurbish your pool equipment, including things like filters. If your filters have been in need of replacement, the winter is a perfect time to get new ones or have the old ones upgraded. With no one using the pool, it means there isn't any downtime to factor in. Switching from the more conventional sand to glass filtration, such as AFM Media, provides a superior level of filtration and cleaner than ever before. Because of the strong structure of glass particles, they are far more resistant than sand to degradation which tends to occur after numerous backwashing cycles. Because of this, glass media can provide effective filtration for as long as 15 years before replacement is necessary - significantly longer than sand media. Adding algaecide to your water to prevent any unwanted bloom while the pool isn't being used. They will also give your pool a thorough shocking. The better the water quality over the winter, the happier your pool will be next spring. Backwash the filters and get them in sound condition (or book very outmoded filters for replacement over the winter). Test the water and perform any extra tasks, such as cleaning up any calcium build-up or limescale. They can also wrap pipes and protect any external equipment from freezing, a serious concern in Britain's bitterest months. After winterising, you must still remember to run your filters every so often to keep the water clean. You can continue to add chlorine yourself, but make sure to test the water first. You won't need to add as much while the pool is not being used. An alternative option, which we recommend, is to have a couple of professional services throughout the winter, this way you can be completely confident that the pool is in the best condition from one season to the next.